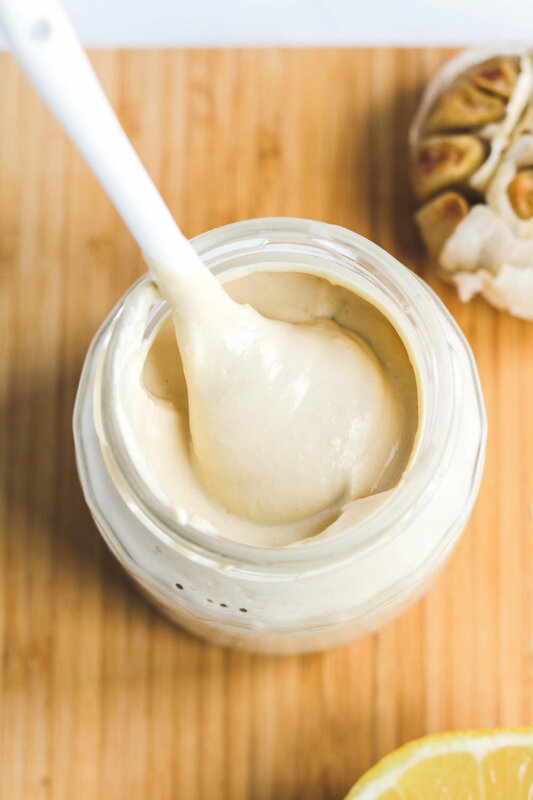 This Easy Vegan Garlic Aioli is smooth, creamy and packed with an aromatic garlicky flavour. Delicious over many savoury meals, can be used as spread or dips and only requires 6 ingredients to make! If you know me, you know I’m obsessed with my Japanese mayo recipe. I use it as a dip, spread it and top it over everything but lately… this Garlic Aioli has been my holy grail. It’s SO creamy, smooth, garlicky and goes well with almost any savoury dish! Plus, it’s super easy to make which makes it like that much better. All you need is 6 ingredients. Although you can make this with raw garlic, I HIGHLY recommend roasting your garlic with a bit of oil BUT this is optional. (I use sesame, cause thats really the only oil I use). Maybe it’s just me, but the flavour of sesame just makes everything that much better? I’ve roasted garlic oil free, and that works too. I kid you not, once you try this aioli you’ll be dipping it, spreading it and drizzling it over everything! I love roasting my garlic with some sesame oil in my air fryer! All you have to do is cut the top part of the garlic so most of the cloves are exposed, wrap it in foil and throw it into your air fryer for 15-20 minutes at 400F. *If you’re in a pinch and didn’t have time to soak your cashews beforehand, add 2-4 tbsp more water or vegetable stock. ** I reduced my aquafaba slightly, and addd in 1/2 cube of vegetable stock to give it more flavour but this is optional! 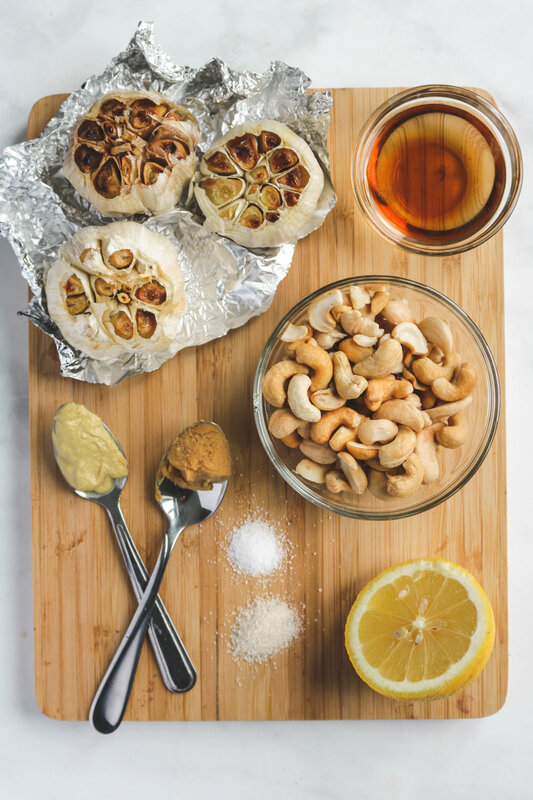 If you recreate this Vegan Roasted Garlic Aioli please share it and let me know what you think by tagging me on Instagram @lisakitahara, I love seeing all of your tasty recreations! Throw all ingredients into a high speed blender and blend until smooth and creamy. Adjust taste by tasting and add liquid to desired consistency.